Dr. Stephen Kuzmak is a Towson, MD family and comprehensive dentist devoted to patient care. 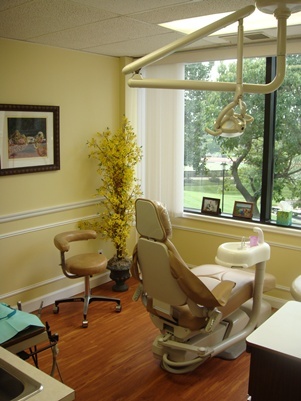 He provides a wide array of dental care procedures so you don't have to go to other specialists for routine treatment. He is passionate about dentistry, bringing cheer and joy to patients, and growing a mutual long-lasting relationship of trust, understanding, and respect with patients. Whenever I meet a group of people, and they hear that I am a dentist, half walk away snickering, and the other half ask questions and look for a flashlight to show me their tooth. I understand that about half of our patients, have some anxiety going to the dentist, and that the other half do too! Well, to tell you a little secret, I've had more dental work than most of my patients, in fact, my two front teeth are implants. I had a terrible accident as a teenager and it affected my smile and adolescent years. I was embarrassed to smile. I get the apprehension of going to the dentist. We make it a goal, to reduce this anxiety. We are thorough and gentle. My hygienists are told they "feel like butterflies in my mouth" and usually my own patients comment, "I didn't feel a thing! that was great!" We have recently renovated the practice to be a source of relaxation and tranquility. Every room has something different. When you enter our practice, you'll notice the warm faux-bronze backlite fireplace mantle. It's warm. The lavendar hygiene room has a grapevine trellis, an beautiful London cafe painting, and an awning over it. The hallway is mojito green and has art niches with beautiful florals, and a garden fountain with running water. 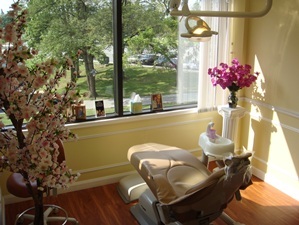 The two treatment rooms are buttercream and have cherryblossom trees, orchids, a forsythia, and stunning white trimwork. I hear "spa" comparrisons and actual excitement with how the practice looks. I enjoy painting walls and wood working - so it was a fun project for me! Without our patients we would obviously not exist. We know that we're not the only dental practice in Towson. It is my daily job to make our patients feel that they have chosen a practice that gives them a great VALUE. I feel that this value comes from the exemplary dental care you will receive, amenities, and also how we listen to our patients. Listening is something we do really well. Yes we will come up with the right dental solutions for you, but it goes beyond that. Listening, and showing gratitude, are practice values to us. The actual listening process is how we convey that you are our top priority, the center of our focus, and your personal feelings and concerns are IMPORTANT for us to process. We enjoy listening. So is your dental health! The center of our practice is patient care. Each practice has a different approach to patient care. Ours is centered on prevention. This is a blend of education and home care, appropriate hygiene visits and needed radiographs, and early conservative treatments. This results in care that is less costly than waiting for a tooth to break or get a big cavity. We offer flouride treatments, sealants, and early intervention to strengthen teeth. We provide the best of what modern dentistry offers today. We have the latest technologies available.